While this works just fine and I was really excited to see it work, it has some problems and serious limitations. I'm sure many of you know a heck of a lot more about jQuery than I do, so if you have any suggestions on how to make this work better, I'm all ears! Umm, demo? Would certainly speak a load louder than reading arbitrary code. click on… the text that say……. VIEW DEMO? for… uhm… DEMO? Really cool Chris. One usability suggestion — use the “pointer” cursor for the “More Info” image. It would make the image look more like a link. What I did is put the reference to the *$(this)* into a variable since we will be using more then once, and the next line will go to the parent of the more-info link, which is the *P* tag then from there it will move up to the photo-area and set the $parent variable to that. We do this because it is a bit faster the using parents() to search for a parent with a particular class. Then we animate that parent element, we fade out the more link, then with the last two animations we start at the parent element and the search with in to *find* the photo div (the #photo-1 and #photo-2) and their respective info areas and we animate those. All in all great work, I have a few posts at my site on picking faster selectors that may help you out, and feel free to hit me up on twitter if you have any questions. fixing the commas will fix what chumsdock is referring to. Nice idea. In the comments had wrote there are problems with ie? It is right and this problem are fixed? 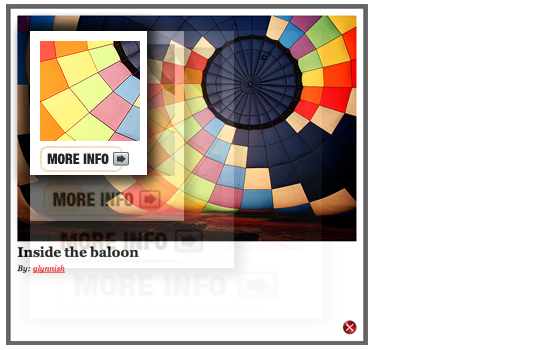 Great jQuery plugin! Good snippets JS kinda make flash useless for presentation and interactive UI. not that impressive….. it will make the page go for a toss.